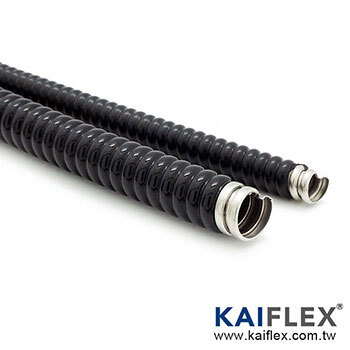 Electrical Flexible Conduit - Kaiphone Technology Co., Ltd.
Kaiphone (KAIFLEX) is one of the minority flexible conduit manufacturers who is certified with both UL & CE in Asia. In addition, we also provide small diameter electronic wire protection tube - Electrical Flexible Conduit. Electrical Flexible Conduit is manufactured with stainless steel strip by continuous wound in square lock, interlocked or mono coil profile. Size range is ID 0.6~16.1mm. This series of flexible conduit featured with excellent flexibility and miniaturized diameter makes the conduit be in light weight and also pressure resistance. That offers benefit for deployment in complex or narrow environments. Specially applicable for protection of signal wire on small equipment, tools, automation system or equipment, robot and etc..